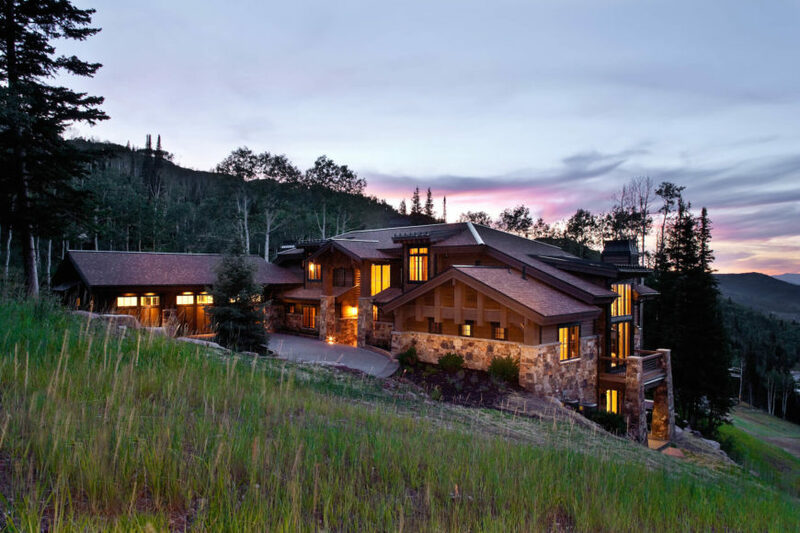 The Park City, Utah based developers crafted this sprawling mountain home with bold natural elements throughout, the most important of which are the large scale use of stone and natural wood. The interior features soaring ceilings with exposed beams, lush marble flooring, and an abundance of uniquely personal touches throughout. Keep an eye out for standout elements like the massive stone fireplace, living room-overlooking catwalk, and innovative dining room light solution. Notable features include a great room, bar, outdoor hot tub and of course being located on a slope surrounded by trees. This home is a perfect example of how rustic elements can be infused with contemporary design to startling effect. In the sprawling, open design living room (great room), we see a full two stories of windows reaching toward the exposed wood beam ceiling, allowing natural light to spread across the expanse of hardwood flooring. A large rounded sectional stands at center before the stone fireplace, with catwalk hallway overhead. 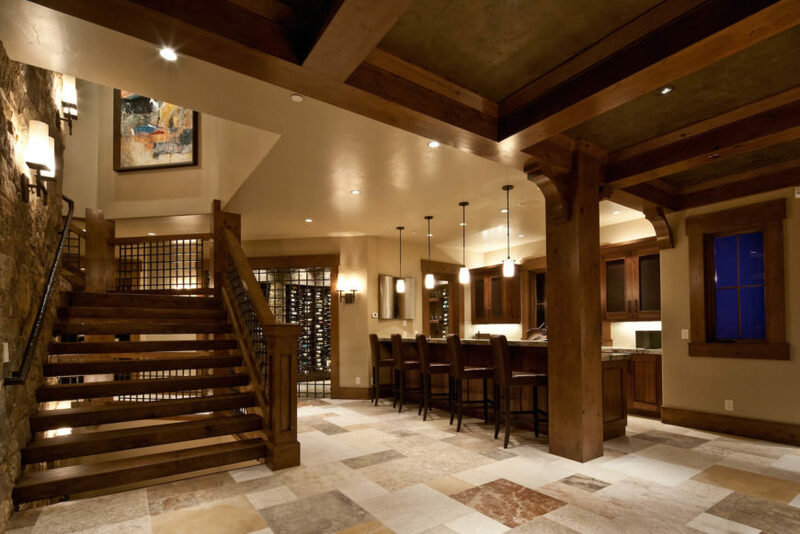 Beside the central all-wood staircase wrapping the stone structure, we see this unique wine bar space, replete with granite topped island and bar stool seating. The extensive wine cellar can be see through doorway to the left. The dining room features a unique arched lighting feature below its lattice-like wood beam ceiling. The table is a single slab of natural wood, surrounded by modern styled Parson chairs, mixing the contemporary and rustic elements. The lavish master bathroom features a wraparound double vanity with vessel sinks over marble countertops and dark wood cabinetry. Large format mirrors and a glass enclosed shower add a bright and open sense. This bathroom, in contrast, features rich earth tones, with natural wood vanity cupboards and copper vessel sink over the marble countertop. 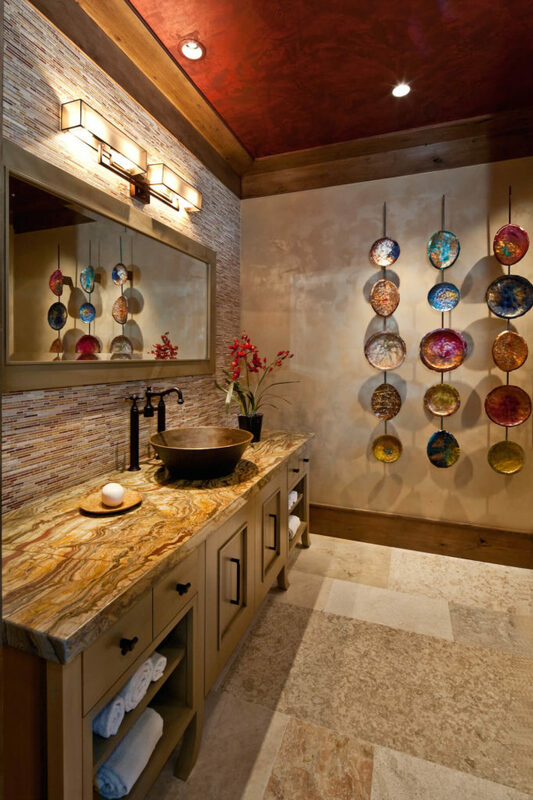 Micro-tile backsplash and brightly colored wall plates add playful detail. On the back side of the home, we see a private patio with jacuzzi, as well as a hillside fire pit area, overlooked by the wraparound balcony and large stone pillars surrounding the home. Full height windows throughout allow for the interplay of indoor and outdoor elements.